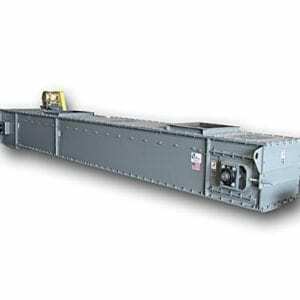 Vertical Screw Conveyors are designed to move bulk materials vertically. It is a specialized screw feeder that is capable of conveying materials where a very small footprint is required. 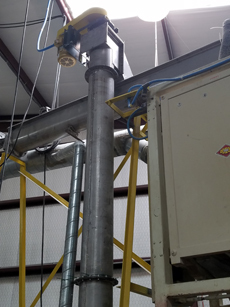 Although Vertical Screw Conveyors perform wonderfully in specific applications they do have limitations when it comes to discharge height and types of materials they are able to convey. A Vertical Screw Conveyor consists of a conveyor screw rotating in a tubular housing with a suitable inlet at the lower end and an outlet at the upper end. Drives are generally located at the top of the vertical conveyor. The top bearing or drive unit must be able to handle both the radial and thrust loads. The method of feeding the vertical screw is most important because some materials lend themselves to one method of feeding better than another. Very light materials for instance cannot be handled in a gravity inlet hopper because the rotating screw acts somewhat like a fan and blows the material back out. This can possibly be overcome by tilting the vertical screw with a inlet feed hopper at the bottom. 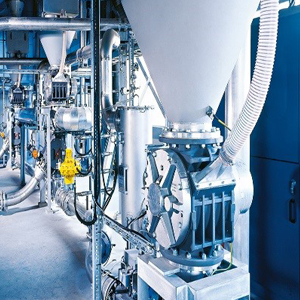 Most materials are fed to a vertical screw by either a straight or offset intake horizontal feeder conveyor. The straight intake style is simple and effective for those materials which will not become damaged by jamming or forcing. The offset style intake is most often used especially for the more fragile materials. The ideal operation of a vertical screw conveyor is to have a controlled and uniform volume of material fed to the unit. Uneven or surge loads and start, stop operations can affect specifications of speed, capacity and horsepower. Some granular or pelletized materials can roll to the bottom of the vertical section after stopping and will then create a starting problem. If a horizontal feeder screw is employed to feed the vertical screw, the speed of the vertical screw may remain constant and any change in the material flow rate would be made only in the horizontal feeder. In this way specific flow rates of material may be obtained. With that being said, a vertical screw is generally not considered an accurate feeding device. One of the features of a vertical screw conveyor is that if the rotation of the vertical screw is stopped the conveyor will be full of material. 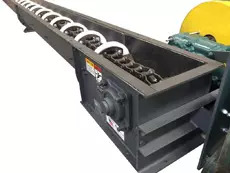 It is also true that if the vertical screw is left turning but the feed of material ceases, the vertical screw conveyor will not empty itself, some of the material will be left in the housing in an amount depending on the material characteristics. It is important to realize, however, that material left over from previous operations will be the first to discharge when the vertical screw conveyor is restarted. Vertical screw conveyor speeds must be adequate not only to convey but to overcome the fall back of material between the tubular housing and the screw. It also must be realized that the speed of the vertical screw imparts a linear velocity to the material, against the pull of gravity, and the velocity is very important in propelling the material past the gaps between the screw sections at the intermediate hanger bearings.